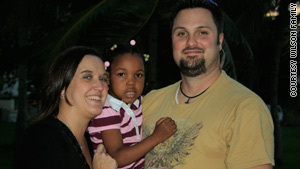 Missy and Mike Wilson hold newly adopted Tia, who survived the earthquake but is still in Haiti. (CNN) -- Mike and Missy Wilson sat in a meeting late Tuesday afternoon, planning a ministry trip to Haiti when they were interrupted by a text message. A co-worker read the news: a powerful earthquake had just struck the Caribbean country. In their Nashville, Tennessee, office, Mike Wilson said, "My heart just dropped" as he listened to the one-line bulletin. The quake's epicenter was a few miles from an orphanage in Carrefour, Haiti, where the Wilsons' 21-year-old daughter Katie was working, and the 5-year-old girl they were about to adopt lived. "I felt like I couldn't take another breath," Missy Wilson said, "I jumped up and yelled, 'This can't be happening.'" The first bits of news were discouraging, as sketchy reports came in of buildings collapsing and widespread destruction. "It was horrible," Missy Wilson said. "We spent hours trying to get any information." The Brent Gambrell Ministries where she is director frequently works with churches and groups in Haiti. Any phone number they had in the country was quickly written on a board in the office. "A group of 20 (people) sat and dialed the numbers over and over and over again." "There are no words to explain that two people I love dearly were in the middle, and I couldn't reach then," Mike Wilson said, his voice cracking. But it was more than 24 hours before they finally got word. A brief, scratchy call from their daughter Katie came through -- she and 5-year-old Tia had survived the quake that destroyed the orphanage. Missy Wilson said Katie was able to say, "I'm alive. We're safe. Tia's safe. Please just know we're alive," before the 40-second call was cut off. It would be Thursday before the Wilsons learned the whole story. Mike Wilson, with two ministry officials, was able to travel into Haiti on a medivac plane, and the three made their way to the town. "There was destruction all around," he said from Haiti, "When I saw what was left of that building, I knew they were protected." Katie, Tia and 47 other children all made it out, but were living in the parking lot across from the shattered orphanage. When Mike Wilson finally found his daughter, she ran up to him at full speed and hugged him. "I can totally see her knocking him to the ground," her mother said. The first order of business: a call home to a nervous mom. Wilson was able to get through on a rare working cell phone, and told his wife, "need to you to hear something." Missy Wilson said the next words were from Tia, barely able to speak English, saying, "'Ma-ma, I love you.' I started screaming at the top of my lungs." Wilson and his colleagues brought food, water and supplies to the 200 quake victims in the parking lot. He described the injured, including one with a broken leg, being treated for two days in the heat with nothing more than an aspirin. The group arranged a bus to take the children to a guest house, a trip delayed when the bus broke down. But that news was minor, knowing they would have shelter and supplies. For the Wilsons, the next struggle is how to bring Tia home. They had been in Haiti just last week finishing paperwork for the adoption, but the office handling the case was destroyed in the quake. "All that paperwork, God knows where it is," Mike Wilson said. "That building was five stories, now it's five feet tall." For Missy, waiting for news at home, "I feel like I'm floating on top of my body." "Like I'm living a dream and waiting to wake up," she said. This week has gone "from hopelessness to hope to tears to 'I can't take another phone call because I don't know what will happen,'" she said. Wilson said he is working with the U.S. Embassy seeking emergency help to bring Tia to Nashville. "We are going to do it," he said, his voice the strongest it had been all day.